Quickspin has released its latest online slot, and it features the firm’s biggest ever multiplier. The Eastern Emeralds slot is available to play at all Quickspin casinos right now, and will transport you to the magic and mystery of the Far East. 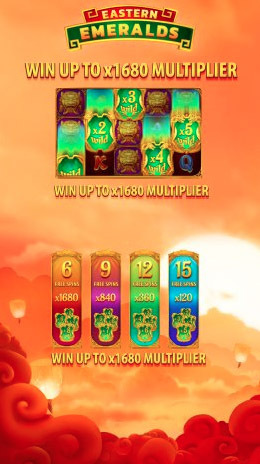 During the free spins, you can opt for a standard multiplier with a large number of bonus rounds, but the truly adventurous can opt for the fewest spins at the top multiplier to see if they can grab some of the jewels promised in the game’s title. So set sail for the misty mountains of Asia and read on to find out how to play the Eastern Emeralds slot, how to win and where to play. What is it Like to Play the Eastern Emeralds Slot? 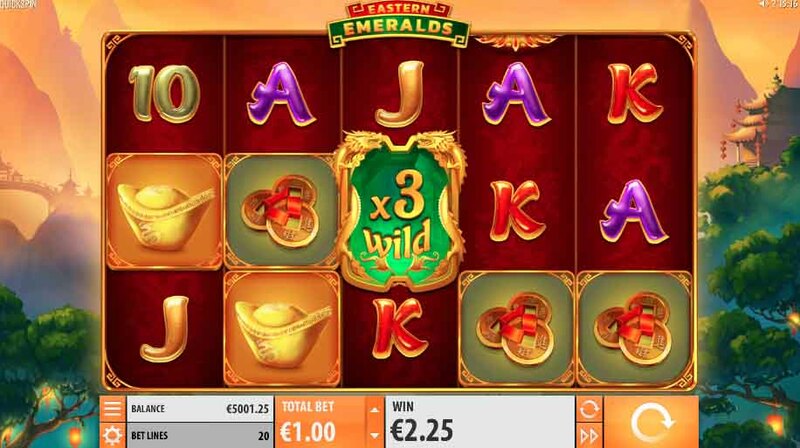 Launching Quickspin’s Eastern Emeralds slot is like heading out into the Chinese wilderness. You come face to face with a rugged, golden terrain at sunrise. Lanterns gleam from the tree, adding to the perfect scene. In addition, traditional music drifts in the background, relaxing you into the game. The symbols are, as you would expect, glinting golden Chinese icons. There are fish, tortoises, coins and dragons, and more to enjoy. They all come beautifully rendered, as you would expect from a Quickspin game. The reels spin smoothly and the whole experience is as laid back as possible. Well, it is until those mighty mulitpliers come along, and then things get serious. Before you can play the Eastern Emeralds slot, you need to find a UK casino site that offers Quickspin games. Thankfully, the company is well renowned in the industry and there are plenty of places to choose from. You can take a look at Mr Green Casino or maybe Bethard, both of which host a great deal of Quickspin titles. Take a look at the reviews of both sites and then choose the venue at which you’d like to play Eastern Emeralds. Then hit the link below to visit. Once you have signed up and confirmed your account, just deposit your funds and head to Eastern Emeralds to play. Set your spin bet, which can stand at anything from 20p to £100 per turn. Spin the reels and keep your fingers crossed that you start bringing in the big wins soon. The big deal here is that the base game brings multiplier Wilds, which during the free spins round can further boost your wins, up to an amazing 1,680x your bet. This, says the company, is its biggest and also one of the largest online slot multipliers anywhere in the world. The array of features are what makes this game extra special, so take a look at what Quickspin has added into the game to offer some real spice to proceedings. The standard Wild only appears on reel one. It is merely a symbol with Wild written on it. However, there multiplier Wilds that can crop up on any of the five reels during play. Wilds substitute for any other symbol, bar the Scatter. 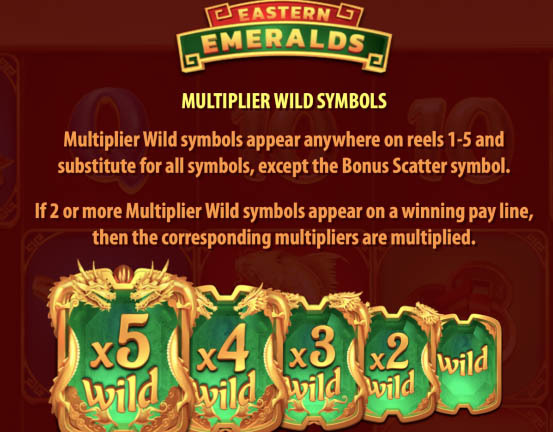 If more than one multiplier Wild makes up a winning line, you earn a multiple of the multiples. This can lead to an overall haul of 120x the usual rate for the win, and this is just the base game! Basically, the lower the number of bonus spins you choose, the bigger the potential multipliers you could land during that round. The decision is entirely yours and comes down to how you prefer to play the game. OPTION 1 – 1,680x multiplier with chance to win up to 2,667 times your stake on every spin. OPTION 2 – 840x multiplier with chance to win up to 2,289 times your stake on every spin. OPTION 3 – 360x multiplier with chance to win up to 987 times your stake on every spin. OPTION 4 – 120x multiplier with chance to win up to 382 times your stake on every spin. Should I Play the Eastern Emeralds Slot? With such an opportunity to score so highly, it’s always worth diving into a game like this. Obviously, it’s not a cakewalk, but it is possible, and that will spur many people on. When youy launch the game, you won’t be disappointed. It looks, sounds and plays well, with enough excitement to keep you entertained for a long time. Head to Mr Green or Bethard Casino right now to start spinning the reels and winning.